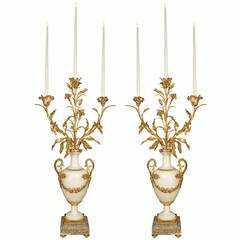 A pair of remarkable and very high quality French early 19th century Louis XVI style. white Carrara marble and ormolu cassolettes. Each stunning urn is raised on a square marble base decorated with ormolu acanthus leaves. At the ormolu socle is a beaded border and large leaves that repeat at the base of the urn. At each side is an ormolu handle that continues down each side accented by a finely chased female bust, joined by a foliate garland, and ormolu beaded trim. At the top is an ormolu foliate border and the removable lid decorated with an ormolu finial. The interior has an ormolu fitted lining. A pair of ormolu-mounted Napoleon III Louis XVI style Brèche d'Alep marble cassolettes.